I am working on a new commission. This one is an Indiana Limestone fountain that will be a similar theme as a bench this client bought from me a few years back. This is the first fountain I have done, so it will be interesting. This video shows about 6 hours of work shortened down to a little over 4 minutes. If you get motion sickness, it might give you a bit of that. I took this with a GoPro camera on my head. I think it is pretty fun to see all of the motion! When I used to carve wood, if a piece was not working out, off to the burn pile it went. Now that I have moved primarily back to stone, burning my mistakes is no longer an option. In general this is a good thing. After a while of sitting there mocking me, I am able to wrangle most pieces into submission and they become a viable work. However, that is not always the case. 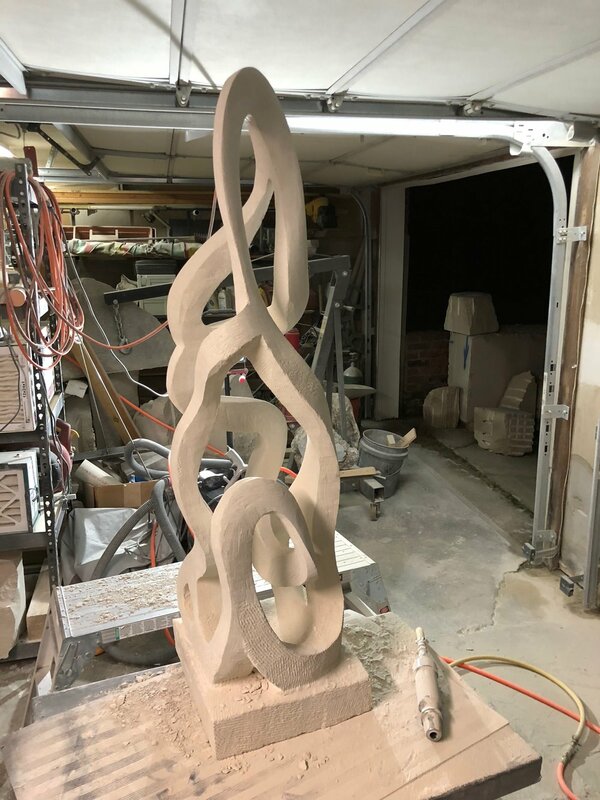 Over that last few months, I have been working on a good sized sculpture that I had planned on submitting to a show at Josephine Sculpture Park. Lately, I have been working on getting my sculptures to be as thin as I can to emphasize visual lightness. I like the dichotomy of the weight of stone with that visual lightness. I was really starting to like the piece and had begun the sanding process. This is where I spend a lot of time using a sander to further thin the stone. I sent use the hammer here because I can break the stone. All was going well until the sander got caught in a curve and skipped out. 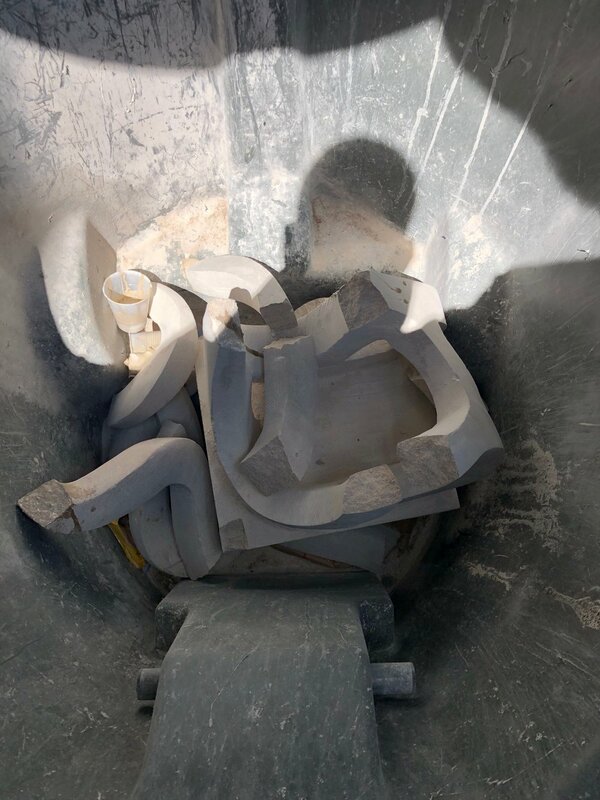 As soon as that happened, I heard the worst sound a sculptor can hear...the clink of stone breaking. This sound is a very distinct sound that gives sculptors a chill down their back. If you want it to happen, it is the coolest sound in the world. If you don't want it to happen, it is the worst sound you can hear. Needless to say, I did not want it to happen. As the piece that broke fell to the floor, I got a sinking feeling in my stomach. The piece that broke really tied the two sides of the sculpture together. I was in panic mode and was looking around the piece to see if it could be salvaged. I grabbed the top of the sculpture to turn it and the top section cam off in my hands. I hand realized that it too had broken in the process. I was so disappointed that had it been a wood piece it would have gone into the burn pile. Since this was stone, it went into the trash! So what do you do when you have a 12" thick block and need about 6"? Simple, use feathers and wedges to cleanly split the block and get it down to a reasonable size. In the video below, I show an easy way to very quickly split a block by drilling a few holes and then letting pressure do its work. When I first started carving, If I needed to get rid of a lot of stone, I would get my point out and start chipping away. It would take me a great deal of time and I would waste a bunch of stone. Now, I break out a hammer drill and some feathers and wedges and I am able to cut the block in half and I have two useable pieces.